Sometimes you wake up late on a Sunday morning and you realize the last time you had a meal was at sunset the day before. No one can agree on what they want, you’re all starving, you don’t have much cash to spend on lunch, but you don’t want to go the drive thru route either. It’s these times the Bunch of Lunch has come to our rescue. Somewhere above fast food, but below an actual sit down meal, it fills a niche with enough carbs to send an Atkins’ devotee screaming. For less than $10 a person, you can stuff your face with pizza, pasta, mashed potatoes, mojo potatoes, chicken, and a token amount of vegetables, if you so choose. The food is just a touch above Hometown Buffet, and the pizza is pretty much the same pizza you’d get normally, except you don’t get to pick the flavors. However, the flavors they do have sometimes include items you won’t see on the normal menu. Such as the super gooey smores pizza. Which is so awesome it makes me sad dessert pizzas are not on the regular menu. 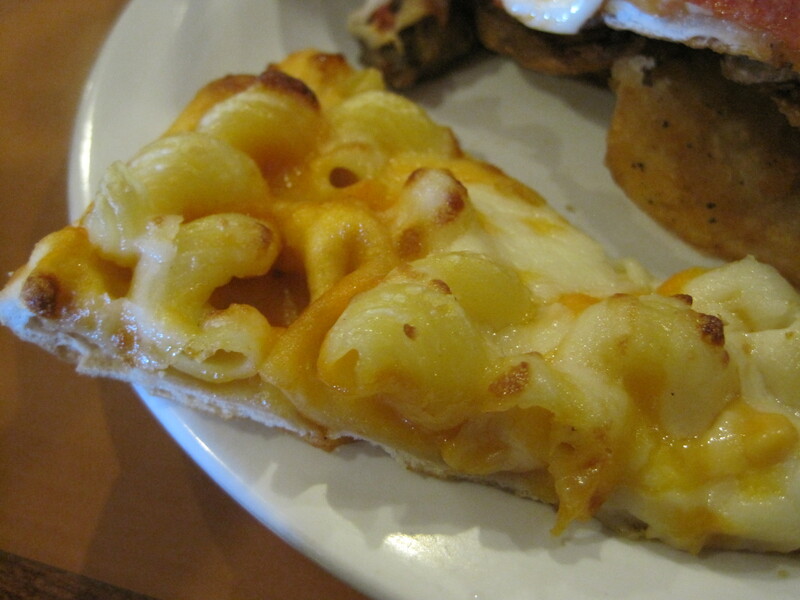 Recently they added a mac and cheese pizza, similar to one I have heard they have at that Cici’s pizza place that advertises on Dish Network, but doesn’t have any SoCal locations. The texture didn’t really work for me, but the little one loved it. Maybe it’s just a kid thing. I’d like to give out love to our local Shakey’s, which is located on Harbor Blvd, just north of Disneyland. It could be the tourist friendly location, but management here is really good. The last time we went, the place was packed, but the manager wandered around helping people find tables, and passing out free arcade tokens at random to the kids. Also, unlike many other Shakey’s we’ve been to, it’s well maintained, with super large screens for catching a Lakers or Angels game while enjoying some mojos.